HOORAY! We have SIX books! 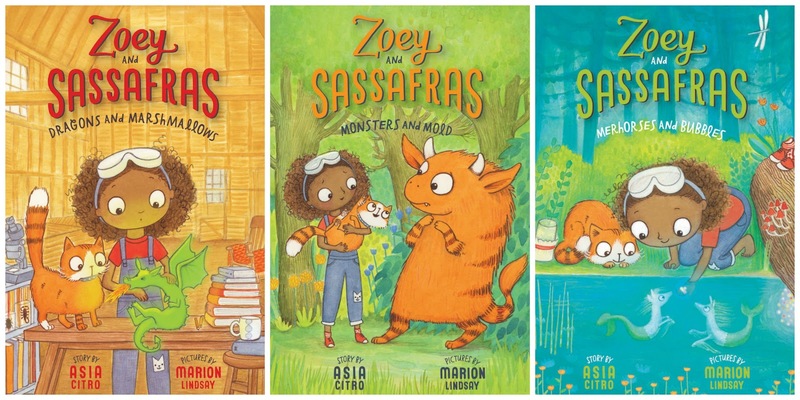 My latest release is my debut fiction series, Zoey and Sassafras, all about a kid and her cat who use the scientific method to help save magical creatures! Click here for the FIRST THREE CHAPTERS of BOOK 1! Dandelion Bubbles, Rain Drums, Seed Bomb Lollipops and more! 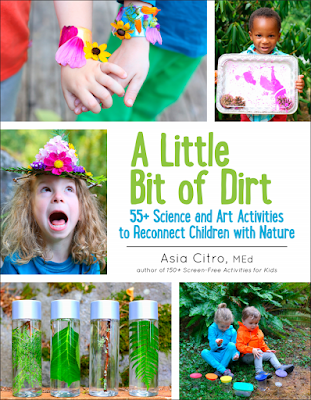 Bursting with creative hands-on outdoor science and art activities, A Little Bit of Dirt is full of motivation to get outside and explore. Whether you're investigating the health of your local stream, making beautiful acrylic sunprints with leaves and flowers, running an experiment with your backyard birds, or concocting nature potions, you'll be fostering an important connection with nature. The engaging activities encourage the use of the senses and imagination and are perfect for all ages. Discover more about the natural world waiting just outside your door! What happens if you water plants with juice? Where can you find bacteria in your house? Is slug slime as strong as a glue stick? How would your child find the answers to these questions? 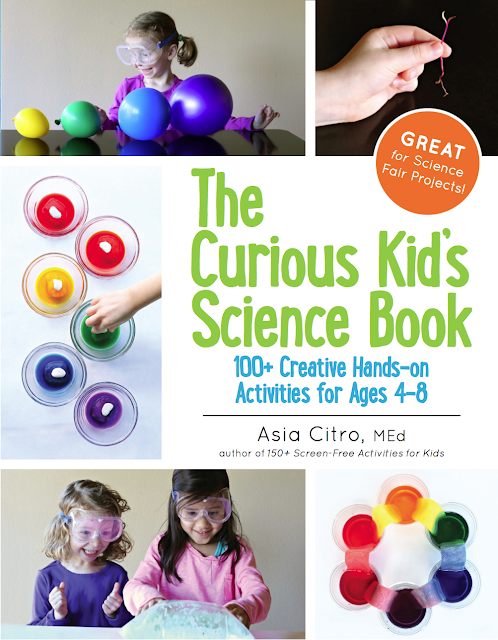 In The Curious Kid's Science Book, your child will learn to design his or her own science investigations to determine the answers! Children will learn to ask their own scientific questions, discover value in failed experiments, and — most importantly — have a blast with science. The 100+ hands-on activities in the book use household items to playfully teach important science, technology, engineering, and math skills. Each creative activity includes age-appropriate explanations and (when possible) real life applications of the concepts covered. 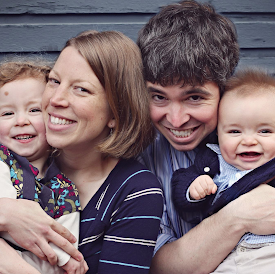 Adding science to your at-home schedule will make a positive impact on your child's learning. Just one experiment a week will help build children's confidence and excitement about the sciences, boost success in the classroom, and give them the tools to design and execute their own science fair projects. Dive into a Bubbling Swamp World. Drum on an Outdoor Sound Wall. Explore the gooeyness of Glowing Slime. I am also a play-at-home-Mommy with an almost one year old who loves being active. Your ideas are so much fun and creative. I just pre-ordered your book. I can't wait for the fresh ideas! We are currently finishing our basement to be a complete kids zone and I have been inspired by your playroom, reading room, and art room. It's all so fun! Best of luck with your book! It's going to make a great gift for my friends with babies and children! Just discovered your blog and I cannot wait for the book .I bet me and my toddler will have lots of fun .Thank you for what you are doing. I ordered your book from France and I am looking forward to having it very very soon ! Hola Maria! Lo siento, en este momento no hay una versión española, pero espero por uno en el futuro. Usted puede comprar la versión Inglés en cualquier lugar del mundo si eso ayuda. Gracias!!! Hi Asia, Is there a separate book for toddlers or it is one book which has activities for babies and toddlers. Are the two books a lot of repeats, or are all (or at least most) the activities in each different? Just don't want to get them both to find much of the same content. Thanks! hi Asia, my kids are coming on 8, and could really do with some fun things like this - so which is the best book for that age ? Ciao Asia! Complimenti per le idee, sono perfette per tenere i bambini lontani da TV e tablet.. Esiste una versione italiana dei libri? Grazie! Finora solo coreano, spagnolo e russo. Ma spero che un giorno che ci sarà un italiano, come pure! Se siete a conoscenza di editori italiani che potrebbero essere interessati, posso dare loro la persona da contattare al mio casa editrice statunitense. I libri sono tutti disponibili per l'acquisto in Italia, ma sono in inglese. Hi, I want to thank you for writing this awesome book("150+ Screen free activities for kids") . It gave me and my baby many good times by trying the experiments out. Recently we tried the " Easy Dough" and " Magic foaming dough". To me, they are similar dough, both using baking soda and vinegar as basic ingredients. I understand the chemical reaction between baking soda and vinegar. But What confused me is why you add salt in the Magic Foaming Dough? Will that accelerate the reaction? to produce more bubbles? I tried to find answers online but I couldn't find it. Would you please explain that for me? Thank you. Thank you very much for the explanation. Great idea! MAYKA HELLO MY NAME AND I AM SPANISH , WE NEED ALL BOOKS TRANSLATED AS ONLY HAVE FOUND TO 150 CHILDREN'S ACTIVITIES . I HOPE THE SOON TO OUR CHILDREN translate. 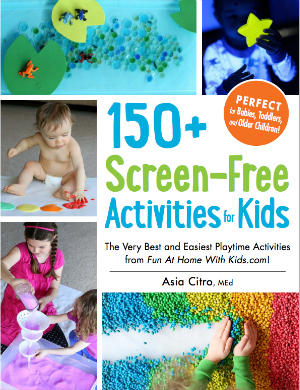 I just received your book 150+ Screen-Free Activities for Kids ...and I love it! I was hoping you could please answer a few questions? 1) How long will the activity last when refrigerated and not in use? 2) Is it safe to use regular coffee if the child is no longer mouthing? 1) Is it possible to use liquid watercolors on white beans, instead of the food coloring? 2) In the past, I used rubbing alcohol and food coloring to color rice. For white beans, do you think rubbing alcohol will make colors last longer and appear more vibrant if I add it to liquid watercolors? Thank you so much. My daughter and I love your work! Hi! If it's easier, you can always email me at funathomewithkids@gmail.com and I'm happy to help out. I hope that this notifies you of my response -- fingers crossed. p.169 -- No, liquid watercolors won't work (we tried them) and no the rubbing alcohol causes the beans to shed their skin and split. We did quite a few different trials and hands-down, the best method that we found was the one described there. Just wanted to let you know that I like your site so much (came across it looking for a UK Slime recipe!) that I am definitely getting your Science Book for my nearly 7 year old - I think we'll have so much fun! Very intrigued by your up & coming fiction books too - love the premise. Thanks for all the great stuff! Hi Camille! None yet, sadly. But I hope someday. The English versions are all available in France, but that's it for now. Sorry about that -- any sized bottle will work for several batches of slime. I didn't put a size on there since any size will work, but I can see how that's confusing!!!! You should be all set with a half gallon for lots of slimy fun!